The sun is setting on a faraway beach. A beach similar to thousand others in the world. The sea is calm and reflects an explosion of colors. A few dozen meters away from the shore, a lone surfer is sitting on his board, waiting for his last wave of the day. A surfer similar to million others in the world. He is alone with himself and nature. 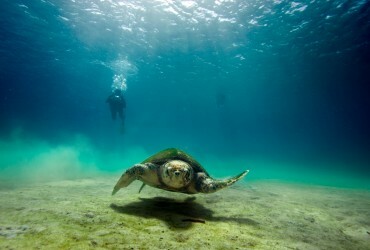 Suddenly, the head of a turtle breaks the surface a short distance away. It comes up for a breath of fresh air and seems to acknowledge the surfer. It’s pure bliss. It’s freedom. It’s surfing at its finest. Unfortunately, on Réunion Island, it’s nothing more than a distant memory. There are not many surfers left, who risk paddling out for a late afternoon session, even when the waves are pumping. For several years now, all marine activities on open beaches are forbidden and punishable by law. People have been redirected to the lagoons that are safely cut off from the ocean by a barrier reef. This strict legislation was introduced after an incredible series of shark attacks. Réunion Island was hit 15 times in less than 5 years. After each accident, a shark cull is organized to catch the culprit. But the international opinion, following the voices of many nature conservancy associations, no longer tolerates the killing of a wild animal for a hobby. 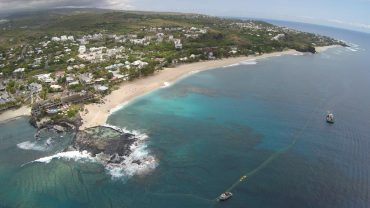 The “shark crisis” swept over Réunion, now notoriously known as the “Shark Island”. Despite the obvious risks, a group of surfers always refused to abide by the new rules which would have meant the death of their passion and, some say, their religion. “Those are the purists, they are the resistance,” Jo Besson tells me on a hot December morning at the port of Saint-Gilles, “Ground Zero” for the shark attacks in Réunion Island. In his thirties, he is wearing a white T-shirt over black shorts. A large pair of black sunglasses holds his hair back. “I have always been a free surfer and I don’t like competition. My reputation comes from my old habit of going surfing all by myself or with a handful of friends for hours on end, during the largest swells,” he tells me with a confidence that usually surrounds high-level athletes. 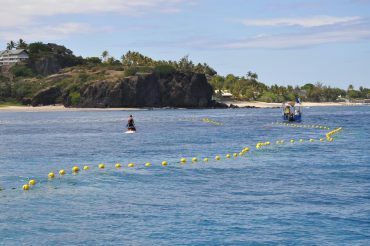 For the past few months, two surf spots no longer need the Vigies Requin to secure the waters: Boucan Canot and Roches Noires, the most famous beaches on the island are both protected by a unique netting system. They offer no less than 112 Olympic-size swimming pool guaranteed shark-free. Along with the surf spots secured by the Vigies, they are the only places where people are allowed to enjoy the waves, according to the 2013 prefectorial order banning all open-beaches activities. Elsewhere in the world, such as in Australia or South Africa, the nets that usually protect popular beaches are highly criticized. They are responsible for blind wildlife massacre, killing all kinds of sharks, along with marine turtles, rays and even dolphins. On the west coast of Réunion Island, in 2015, this was definitely not an option. 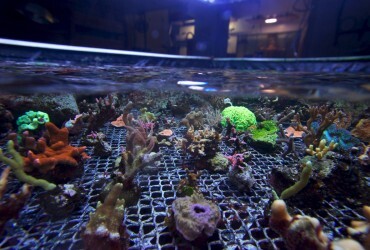 The unique non-trapping mesh was developed to allow all marine fauna to cross it without harm, except the very large animals that are stopped offshore of this physical barrier. 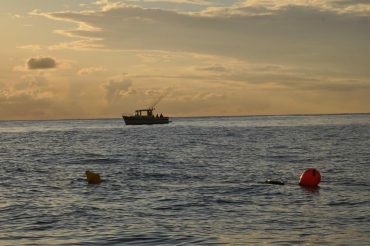 Although its effectiveness is immediate, people that know the ocean’s power can’t help but doubt the net’s long-term viability. During the cyclone season in the Indian Ocean, the coasts of Réunion Island are regularly battered by high-velocity winds and massive swells that destroy everything in their path. Seanergy, the local firm that developed the netting system, had to come up with a revolutionary idea: the two structures of Boucan Canot and Roches Noires can be manually folded to the bottom of the seafloor, therefore avoiding the worse of the destructive marine forces. In eight months, they were successfully lowered and reinstalled several times. These groundbreaking solutions have a cost. Several days are necessary for a crew of divers to fold the huge mesh at the bottom of the seafloor. Each disassembly and reassembly costs 40’000 euros. But it’s a necessary evil to allow the securing of a 1.5-million-euro-apiece system. Despite the criticism and skepticism, the nets were an instant success. 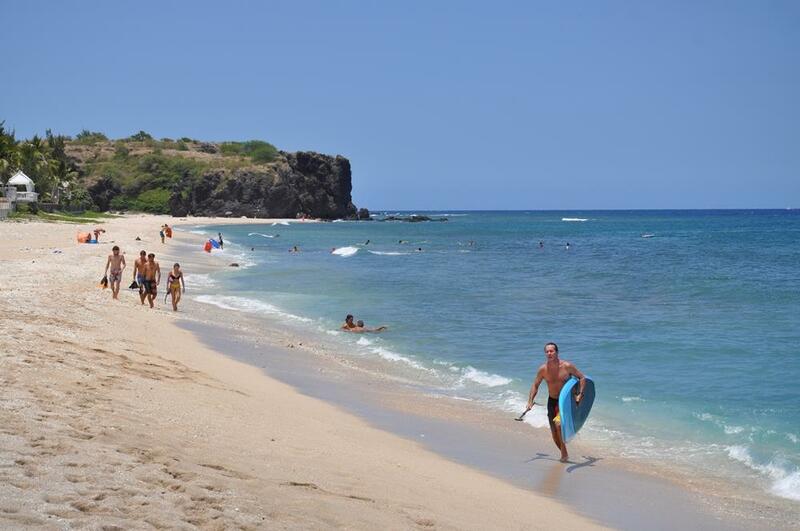 A large crowd gathered on the white sand of Boucan Canot in December 2015 to witness the inauguration of the first fully secured surf and bathing spot since 2011. 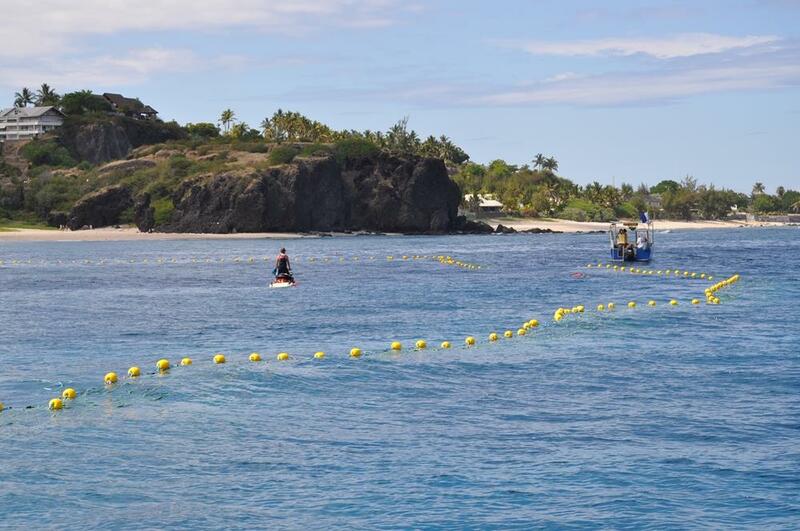 A surf competition was even held in the nets of Roches Noires in April of 2016. Both the nets and the vigies are unanimously acclaimed, and the island can finally take a breath of fresh air after years of suffocation. Yet, all of the conflicts are far from being resolved. A third program is at the heart of a heated debate. 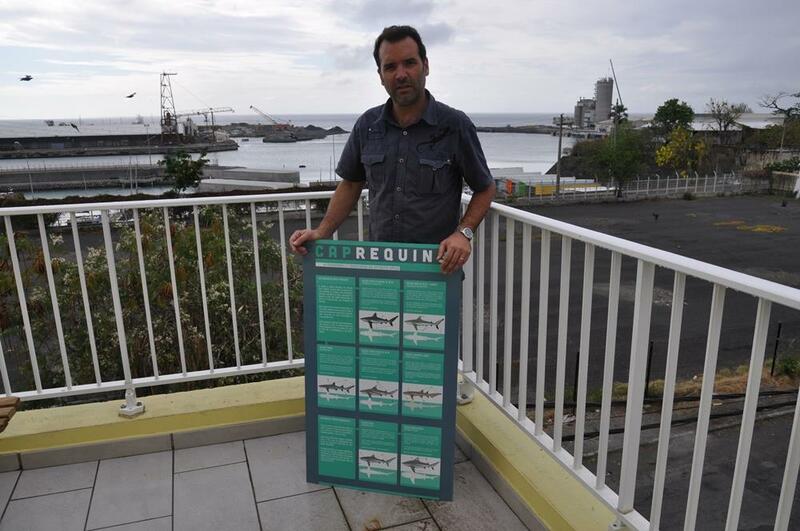 “Cap Requins”, the shark culling operations by the CRPMEM (the local professional fishery committee) divides the people from Réunion Island and the rest of the world since its beginning in 2014. David Guyomard is at the head of the criticized program, and he welcomed me at the committee’s headquarters in the town of Le Port. In his office, the desk is literally flooded by files and various papers of all sizes and colors. There is hardly a spot left to put a cup of coffee. “I came back yesterday from Australia, he tells me as an explanation. We were invited in Coffs Harbour to present our project.” The aim of Cap Requins is to lower the density of large bull and tiger sharks in the waters of Réunion Island, by fishing them. “We absolutely do not want to eradicate these two species”, he tells me straight up. Killing wild animals for the sake of a hobby? An inconceivable idea prior to the shark crisis that debuted in 2011. 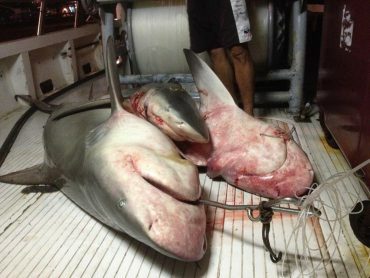 “Yet, Guyomard tells me, after almost 5 years of recurrent tragedies, many deadly, and after countless discussions and meetings that didn’t come up with an alternate and satisfying solution, a shark culling program became obvious.” Around the world, such programs are controversial, to say the least, especially because they blindly catch species that shouldn’t be targeted. This would have never been accepted by the population and the public authorities in Réunion Island. After months of research, revolutionary solutions were found. “I had the idea after reading about ancient swordfish fishing techniques in Cuba, says Guyomard. At night, they used to put a burning torch on the buoy over their fishing lines. When a fish took the bait, the flame would fall in the water and from the beach the fishermen were alerted that something was going on.” By adding a pinch of technology to this smart recipe, in the form of a solar-powered GPS transmitter, David Guyomard and Christophe “Criquet” Perry, one of the best bull shark fisherman on Réunion Island, developed the “smart-drumline”. This innovative instrument is what was presented to a group of very interested Australians, in December 2015. 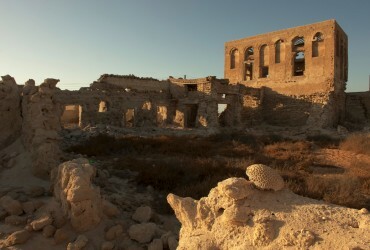 Today, Cap Requins is running against the overwhelming majority of conservancy programs. Those who support the culling program are highly criticized. “It’s plainly unbelievable! France is massively subsidizing the killing of sharks, all the way to marine protected areas,” cries François Sarano, the founder of the French ecological association Longitude 181 Nature, which is active on this subject since the beginning of the shark crisis. The nature conservationist bases his knowledge on decades of diving with large sharks, and regrets their killing. Criticism not only comes from associations on mainland France. Thierry Gazzo is a professional fisherman from Saint-Gilles, and much like all the other people living on the west coast of Réunion Island, he was taken aback by the series of shark attacks that started in 2011. 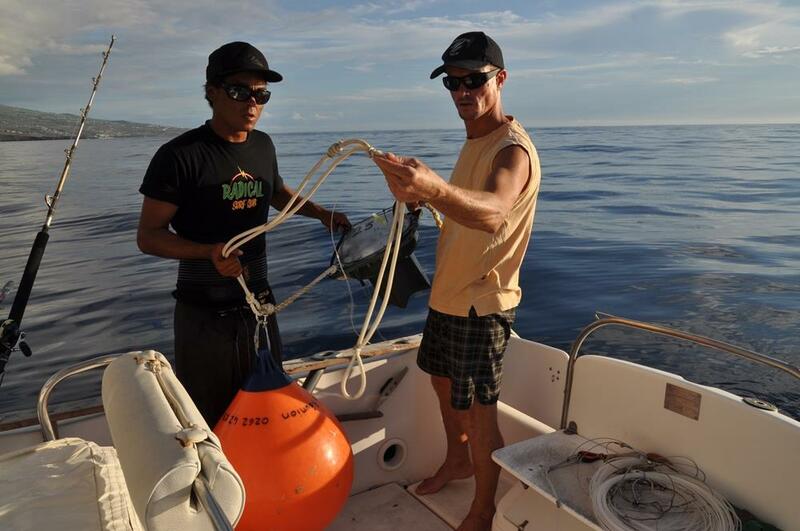 He worked for the CHARC scientific study in order to catch, tag, release and monitor 40 bull sharks and 40 tiger sharks. 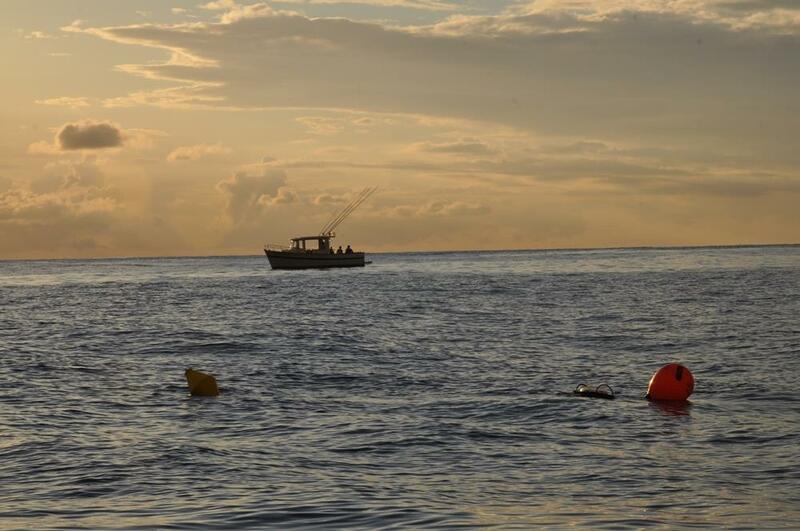 His father, Guy Gazzo, is a spear-fisherman legend on the island that, since the beginning, had warned against the dangers of establishing a marine reserve and removing all of the fishermen from the water column in front of the popular beaches. 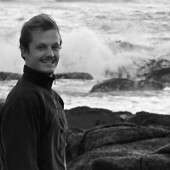 Guy Gazzo was also the very first Vigie Requin, who decided to secure a surf spot by himself while his nephew was competing in a surf event at the Roches Noires beach in 2011. David Guyomard, the engineer of the fishery committee, doesn’t agree: “The question of our drum lines that supposedly attract sharks from far away is a myth largely promoted by our opponents since it is an easy one to make the public swallow. We have followed this element during the experimental installation of our drum lines in 2014, while the sharks’ tags from the CHARC study were still emitting. We were able to prove that there was no increase whatsoever in the number of sharks, in the frequency, in the hours or in the days of visit compared to 2013, prior to our drum lines testing. In fact, the baits we use on our equipment are whole fish that weigh between 1.5 and three kilos, whose olfactory traces dissipate really quickly in the salt water and lose 90% of their intensity after 6 hours. The sea band along the coast is not a closed swimming pool, and the olfactory stimuli are countless, between the natural preys, the rubbish from mainland and baits from other fishermen. Our drum lines that are baited only at night in front of the beaches where marine activities take place can’t possibly be held responsible for the behavior’s modification of these predators that were already present in these waters long before our project started.” Still according to the engineer, the tiger sharks are culled because a balance exists between the two species of marine predators. After killing too many bull sharks with the netting system in South Africa, the KwaZulu Natal Shark Board realized that tiger sharks were moving in. Despite the criticism and doubts, Cap Requins has the benefit of increasing the knowledge and science, and helps to protect the other shark species that are mainly harmless to man. The fishery committee voted a resolution forbidding the fishing of reef sharks, that are still suffering from recreational fishermen. An important awareness raising project was put into place. Ideally, the west coast of Réunion Island would be reconquered by the reef sharks, once the population of bull sharks has decreased. 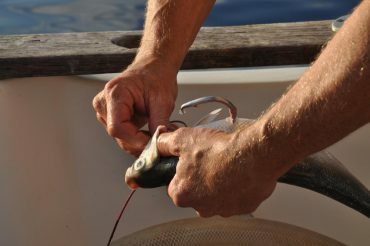 Recently, a “white-tip” reef shark was caught, tagged and released in front of the port in Saint-Gilles. It had been years since such an animal was seen in the area. “Now, we hope that the water quality on the coast is sufficient to allow these fragile species to recolonize the area” concludes David Guyomard. For many educated people on the island, such as Eric Pinault, a targeted and precise culling program is the appropriate answer, waiting for a better solution that would satisfy everybody. 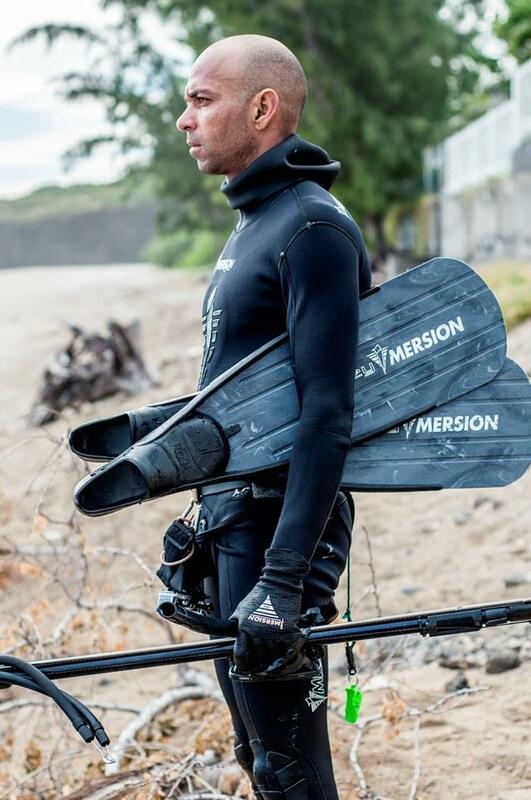 Eric is a creole surfer from Réunion Island. He used to have a surf shop and several programs and activities that revolved around his passion. Because of the shark crisis, he had to abandon all of them and say goodbye to his old life. “Without looking into the matter, he tells me, the majority of people will think that it’s immoral to kill a wild animal for a hobby. The ocean is the shark’s territory, and we don’t belong there. It’s the first logical judgment. 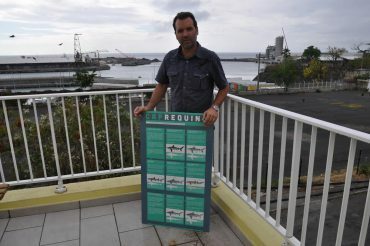 But here on Réunion Island, it’s a little more complicated than than.” Still, Pinault doesn’t expect the Cap Requins program to last forever: “The international public opinion is in such a contradiction with what is happening here that I cannot see the culling program last longer that three or four more years. After, the pressure will simply be too heavy, such as in Australia where it is almost impossible to kill a dangerous shark nowadays. We really need to look into non-lethal technological solutions. For me, the future will all be about detection”. In this domain, there are countless prototypes. An Australian firm developed a “Clever Buoy”, capable with its state-of-the-art sonar to detect and differentiate a shark from a marine mammal for example. It works a little like the facial detection on Facebook. Once the computer is positive there is a predator heading towards a popular beach, it sends the information to the lifesavers who are able to quickly react. Réunion Island has been spared of shark attacks for more than a year now. 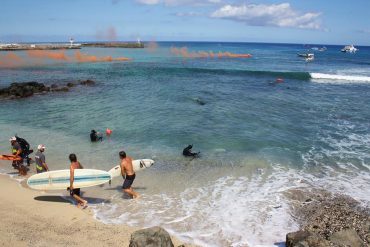 The last fatal accident is still fresh in every memory, as Elio, a 13-year-old upcoming surf champion and loved member of the community was killed on a Sunday of April of 2015, only three days before the beginning of the Vigies Requins program. The people of Réunion can’t help but wonder if this long attack-free period is only temporary, or if it’s finally the light at the end of the tunnel. Despite the tragedies, the “shark crisis” that hit the island sparked innovative ideas, and we are now much more knowledgeable on the elusive marine predators. 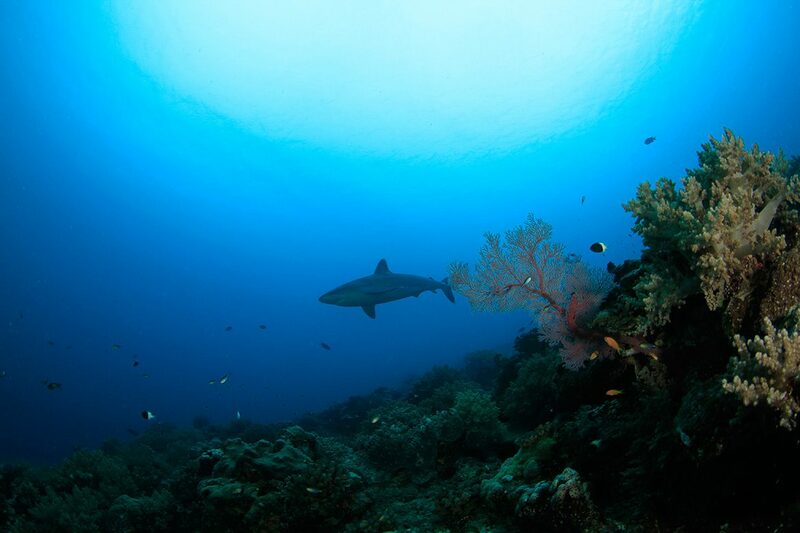 Recently, a “resource and support center on the shark risk” was created to coordinate the efforts. Many countries are interested and are closely watching what has been happening in Réunion, the only island surrounded by a forbidden ocean…. For how long?